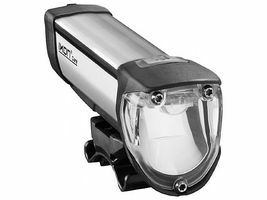 Busch & Muller's battery-powered headlight series is the IXON line. These lights use similar optics to their renowned dynamo-powered lights, but do not require an expensive and difficult-to-install dynamo hub. 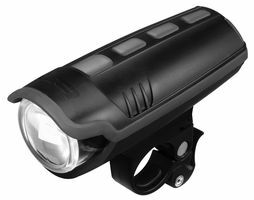 The Ixon Pure is B&M's older battery-powered headlight. It features optimized optics which focus light towards the road, and away from the sky and the eyes of oncoming traffic. It uses three AA batteries, and comes with rechargeable NiMH batteries included. 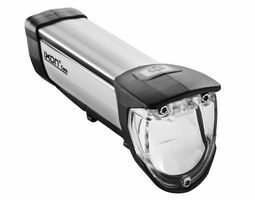 The Ixon Core is B&M's first all-in-one light powered by an integrated rechargeable lithium battery. Its custom optics reflect the light directly towards the road, providing an even output that doesn't waste light shining into the sky or the eyes of oncoming traffic.